In the summer of 1776, fifty-six men put their quills to a dangerous document they called the Declaration of Independence. Among them was a thirty-year-old doctor named Benjamin Rush. One of the youngest signatories, he was also, among stiff competition, one of the most visionary. From improbable beginnings as the son of a Philadelphia blacksmith, Rush grew into an internationally renowned writer, reformer, and medical pioneer who touched virtually every page in the story of the nation’s founding. He was Franklin’s protégé, the editor of Common Sense, and Washington’s surgeon general. He was a fierce progressive agitator—a vocal opponent of slavery and prejudice by race, religion or gender, a champion of public education—even as his convictions threatened his name and career, time and again. He was a confidante, and often the physician, of America’s first leaders; he brokered the twilight peace between John Adams and Thomas Jefferson. As a doctor, he became “the American Hippocrates,” whose brilliant, humane insights and institutional reforms revolutionized the understanding and treatment of mental illness in ways that still reverberate. 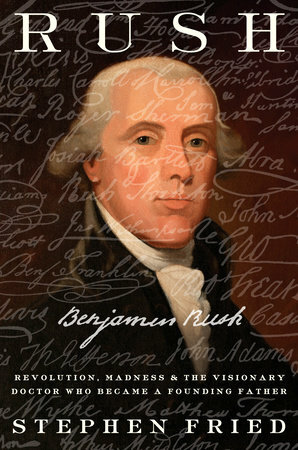 Like the greatest Revolutionary minds, Dr. Benjamin Rush recognized that 1776 was only the beginning of the American experiment. Rush brings new drama to his singular life and towering legacy, finally installing him in the pantheon of our wisest and boldest Founding Fathers.